On February 26th, 2016, our partners in Mexico released that their estimates of the overwintering monarch butterfly population has increased by 255%! This year, monarchs are inhabiting approximately 10 acres of oyamel fir forests, which is up from 2.8 acres last year. This is a great accomplishment for the iconic species, but more work is needed to restore the eastern monarch population to historic numbers. Best known for their extensive 2,000 mile migration, monarchs travel from southern Canada and the United States every fall to their overwintering home in the Monarch Butterfly Biosphere Reserve in Mexico. Here, the monarchs gather by the millions in oyamel fir trees where the weather is mild enough to survive the winter. This dense gathering also allows scientists to accurately estimate the monarch population, based on the total area they occupy. It is important to know the health of the monarch butterflies because they serve as an indicator for other pollinating insects. Pollinating insects are crucial to the success of our agricultural crops and native wildlife! This monarch has been tagged for research to learn more about the monarch migration! Photo Credit: Monarch butterflies by Joanna Gilkeson/USFWS. On their return flight to the United States and Canada in early spring, monarchs utilize native wildflower meadows and milkweed plants along the way. These areas allow monarchs to reproduce so the newest generations can continue north to their summer grounds. Milkweed is the monarch’s host plant, meaning they need these plants for survival. The Service has been diligently working to improve this monarch habitat and increase the overall population. Although we have made significant progress this past year, our job is not done! Help save the monarchs by reducing your use of pesticides and planting more milkweed and wildflowers! 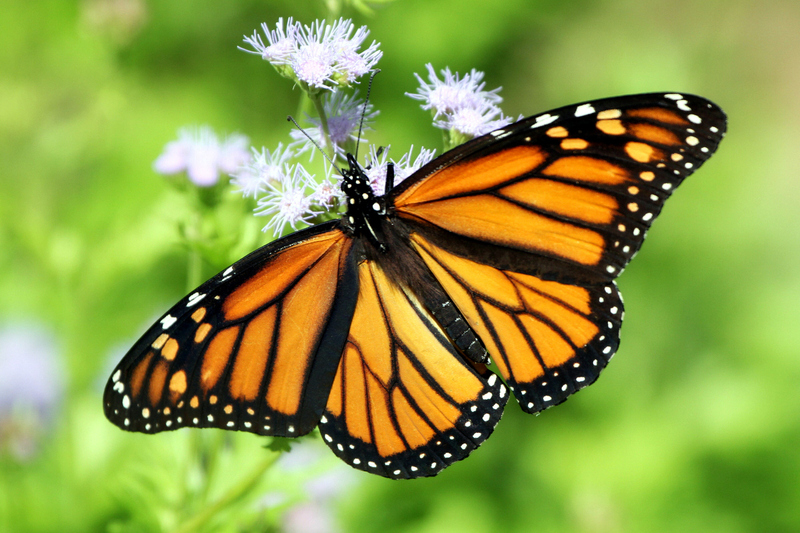 Click here to learn more about how you can protect the monarch butterfly and other pollinators. This entry was posted in Blog entries, Habitat restoration, Science and research and tagged Mexico, monarch butterfly, Monarch Butterfly Biosphere Reserve, Oyamel Firs, pollinators, Save the Monarch on March 2, 2016 by leahahawthorn. Today Curtis Bennett from the National Aquarium in Baltimore writes in to share his experiences from the 2015 BioBlitz at Masonville Cove. Here he explains his mission to conserve wildlife and engage the community through citizen science to preserve species like the iconic monarch butterfly. The National Aquarium’s Conservation Department recently hosted its second annual Masonville Cove BioBlitz. Masonville Cove is an urban wildlife refuge partnership site in Baltimore, Maryland, encompassing 54 acres of upland area, including tidal wetlands and vernal pools, as well as 70 acres of water, which provide valuable habitat for a variety of plant and wildlife species. This annual bioblitz provides a snapshot of the biodiversity of Masonville Cove. The Masonville Cove BioBlitz is unique because it encourages local students and community members to work with scientists, provides exposure to the outdoor environment and local wildlife and it helps to build a strong connection to Masonville Cove. From tracking biodiversity to connecting urban residents to nature and experiencing the power of observation and discovery, the Masonville Cove BioBlitz provides an example of how just one event at a single site can encompasses the core values of the Greater Baltimore Wilderness Coalition. This alliance, which includes the National Aquarium and the Service, supports a vision of expanding a connected and protected green infrastructure network in central Maryland, from the Chesapeake Bay to the Piedmont. Large-scale green spaces, such as Masonville Cove, within the Greater Baltimore area are critical in order to ensure the protection of local biodiversity. Additionally, environmental education programs such as a bioblitz, allow people the opportunity to explore these natural areas, observe the local species and learn how they can further contribute to conservation efforts. 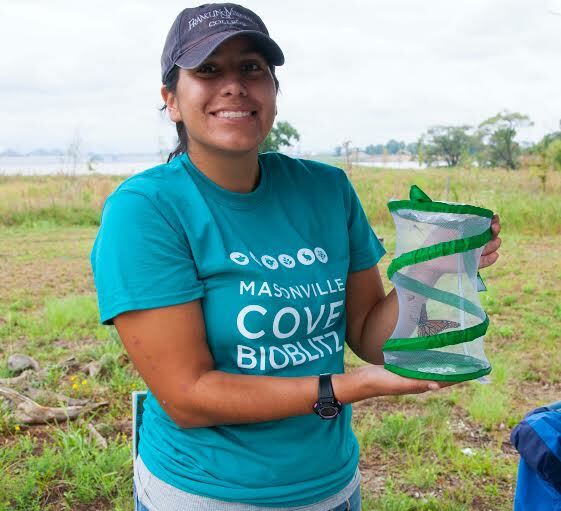 Empowering people in Baltimore to engage in conservation action is one of the goals of the National Aquarium’s citizen science program, and the Masonville Cove BioBlitz is a critical component. This program encourages people of all ages to “get nerdy with nature” and make observations to contribute to science. This year, we made 219 observations of 164 different species! For the bioblitz, all observations were entered into iNaturalist, just one of many citizen science projects with a mobile application. However at each station participants were provided with information about other citizen science projects and apps, through our citizen science website. When citizen science projects and apps are directly tied to specific conservation efforts, the impact is even more powerful. Not only does this increase conservation awareness but the project and/or app serves as the tool to encourage public involvement. During this year’s bioblitz the National Aquarium highlighted one such project/app- Journey North, which seeks to track migratory species, such as the monarch butterfly. Masonville Cove provides critical habitat for monarchs, given the presence of three local milkweed species and other nectar sources. Throughout the bioblitz, participants observed several adult monarchs and upon learning their conservation story, were encouraged to further conservation efforts by tracking their presence or by providing wildlife habitat through our certification program. Continued efforts to connect people to nature and empowering them to take conservation actions will ensure that species such as the monarch butterfly will continue to be observed at the Masonville Cove BioBlitz for years to come. 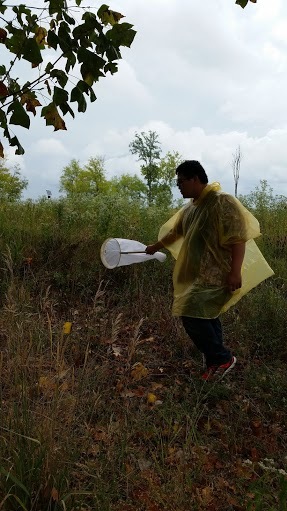 This entry was posted in Blog entries, National wildlife refuges, Science and research, Youth and tagged Baltimore, bioblitz, citizen science, community, Curtis Bennett, Journey North, Leah Hawthorn, Maryland, Masonville Cove, monarch, monarch butterfly, Save the Monarch, urban wildlife refuge partnership on September 25, 2015 by leahahawthorn. It only takes about a month for the Monarch to go through its entire metamorphosis and bring the next generation into the world. These beautiful insects live 2-5 weeks while enjoying the summer season and continuing their genetic line. Incredibly, this cycle can occur about three times throughout the summer! On the fourth generation, however, something spectacular takes place. The Monarch eggs laid in late August and September are destined for something much more magnificent than their three previous generations. A chrysalis only moments before it emerged. The orange and black pigmentation is the last stage of development during the pupal stage. Our fourth generation monarchs are the migrators. We will be seeing these guys as caterpillars and butterflies in the upcoming weeks. These monarchs will develop into physically and behaviorally different insects than their parents and grandparents. Born with an underdeveloped reproductive systems, these little guys were created to channel all of their energy into one thing: flight. Weighing only one half of a gram, these mighty flyers fuel up on nectar for their migration to Mexico for the winter. The 2,000-3,000 mile journey is extremely dangerous and monarchs are at risk from large storm events and lack of feeding and breeding habitat. Only a small percentage of monarchs will make it to their destination. The lucky survivors arrive in just in time for the Mexican Holiday, Day of the Dead, where it’s believe monarchs are the souls of loved ones that return each year. You can identify this monarch as a female by the lack of black patches on the hind wing. After taking shelter in the Oyamel Fir forests in the Transvolcanic Mountains of central Mexico, the monarchs begin their journey north in March, now fully mature. During their journey, they will reproduce and eventually die, having lived up to nine times longer than the first three generations. In addition to being an iconic species, the monarchs play a vital role in our ecosystems, supporting plant and wildlife biodiversity. Unfortunately, monarch populations have declined by 90 percent in the last 20 years. We can help by planting milkweed, reducing our pesticide use and spreading the word about these small but mighty butterflies! Over the next several weeks, I’ll be sharing stories about what we’re doing to help with our partners and how you can also help this iconic species. In the meantime, to learn more about the plight of the monarch and what you can do to help, visit our Save the Monarch page! This entry was posted in Blog entries, Habitat restoration and tagged #savethemonarch, caterpillar, chrysalis, Leah Hawthorn, metamorphosis, Mexico, migration, monarch, monarch butterfly, monarch migration, oyamel fir trees, Save the Monarch on August 27, 2015 by leahahawthorn.